Getting started with proactive support is easier than ever with Connect’s web push to Web Widget integration. This Limited Availability feature, available to customers that have completed the Support to Connect integration, will allow you to offer help to customers through the Web Widget as a channel in Connect. This simple integration between Connect and the Web Widgetmakes implementing proactive support as easy as running any campaign in Connect. In this article, we’ll describe the how to access and use the web push to Web Widget feature and how to measure the performance of your proactive support campaigns. Expressed simply, proactive support is about detecting when a customer enters a ‘risky situation’ and giving that customer the support they need before they ask for it. Connect already allows detection of ‘risky situations’ by tracking events, but the new web push to Web Widget integration allows you to act on that situation by sending a customer a web push message that opens a Guide article in the Web Widget. By doing so, the customer is being served help content before they need to look for help themselves, known as proactive support. Furthermore, because this feature is built off the back of the Support to Connect integration, not only can the help content be served, but you can track its effectiveness of reducing support tickets allow you to measure the ROI of your campaign. The web push to Web Widget integration is available for all Support customers in our Limited Availability that have Guide activated. The changes within Connect are subtle, so creating a web push to Web Widget campaign is very similar to a regular web push campaign. 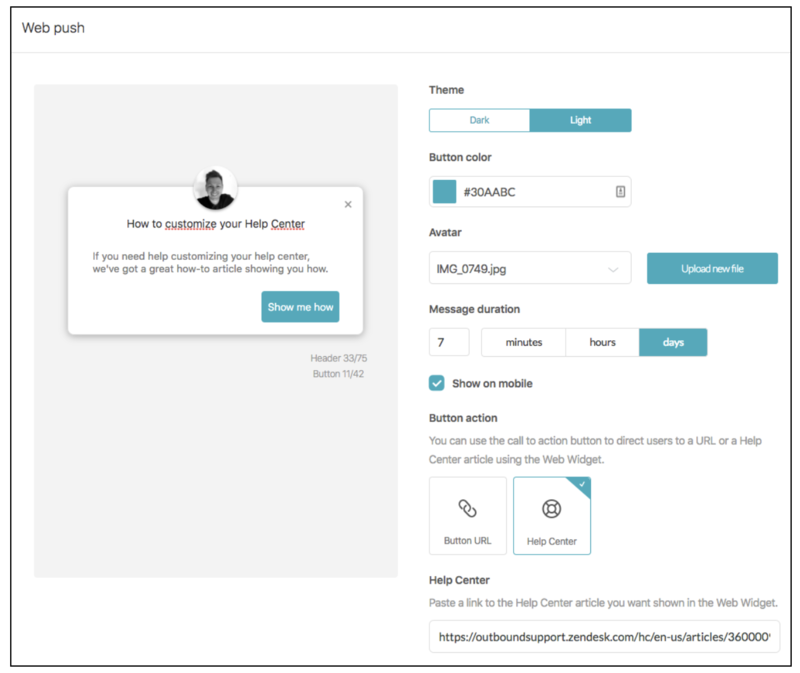 If you are a Support customer in our Limited Availability, when you set up a campaign using the web push channel a new “Button action” field with two options; “Button URL” and “Help Center”, will be present. Selecting “Help Center” will ask for the Guide article you’d like to show in the Web Widget. You can use the web push to Web Widget feature on both broadcast and trigger campaigns and you can also use it as a variant in A/B tests. When the button in the web push is clicked the Web Widget will be presented. This will happen even if the Web Widget is turned off in the Web Widget settings, as long as the snippet is on the page, the Web Widget will be presented. When the Web Widget is presented, it will show as it is configured in the Support Web Widget settings. This means the contact options in your Web Widget will still be available. This also means the Web Widget will show per the theme colour in the Web Widget settings. This is an important consideration when selecting the web push button colour in Connect, selecting the same colour as the Web Widget theme colour will lead to a more seamless user experience. One of the main benefits of Connect is being able to measure the performance of your targeted messages against a business outcome, such as how an “Add to cart” campaign increases the chance of a “Purchase” event. Web push to Web Widget campaigns are no different, and you can easily add a goal to your campaign to track performance. Create a trigger campaign in Connect using the event that identifies your customer is in a risky situation, for example, the product they try to buy is out of stock. Set your web push to Web Widget variant to 50% of your user allocation. Set the Control Group to the remaining 50%. If you have multiple variants, allocate the users evenly across the variants and the control group. Set you campaign goal to “[Support] Ticket Created”. By following the above steps, your campaign will measure how many Support tickets are created from users that received the message vs users that didn’t. If your proactive support campaign is working, you will see a lower number of goal completions in the variant than the control group. If the number is similar or higher, your proactive support campaign is not working or worse yet, creating support tickets. At this stage the web push to Web Widget feature is only in a Limited Availability. As a result, some limitation exist, the main being that only customers who have completed the Support to Connect integration have access to this feature. In addition to this, there are a couple of limitations when setting up a web push to Web Widget campaign around the Help Center URL field. Firstly, the URL entered must be for an article in the Guide account linked to the Support account integrated with Connect. If the URL isn’t from the same Support account, the widget will not show and the link will not work. In addition to this, the URL will allow host mapped Guide articles, however there is the possibility of validation errors being thrown due to the host mapped URL, these errors will require support to resolve. The last current limitation on this feature at the moment, is both the Web Widget and connect snippets must be present on your website for the feature to work. In due course, the feature will work with just one snippet, but at the moment, both are required.